First off, yes, I do know that these videos are older than Moses. They are British Army training videos from, I guess, the 1960’s. They do, however, do a good job of illustrating some points visually, and I will provide some commentary to both help you make sense of it, and note where things have been updated. After all, SUT is a fairly timeless art, and the differences between the video and what happens today are a combination of variances in weapon systems, and lessons learned. The section in the video is set up in a different way to modern sections / squads. It has more people than a standard 8 or 9 man (UK/US Army) section / squad. This is mainly a function of weapon systems. Today, we often have two equally balanced ‘fire teams.’ In the videos, we have a belt fed ‘gun group’ and a ‘rifle group.’ The rifle group is capable of being further subdivided into groups, or fire teams. The idea is to set up the gun group with the belt fed (7.62 GPMG, same as M240) in a position to support while the rifle group maneuvers in a number of different possible ways. In the British Army at the time, the rifle group was equipped with the 7.62 SLR (FN, single shot semi-auto only). This informed the section order of battle at the time, which is always changing as weapon systems change. However, other than the specific weapon systems employed, and the different groupings, tactics are essentially the same, utilizing the principles of fire and maneuver, or fire and movement, to close with and destroy the enemy. 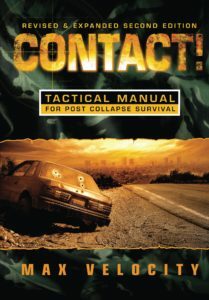 If you translate that across to you as a citizen CUTT (Citizen Unconventional Tactical team) member, as laid out in some examples on the already referenced ‘CUTT Maneuver: Patrol Formations & Actions on Contact‘ page, you will utilize the weapon systems available to you to design your squad order of battle (ORBAT). You are likely not equipped with a belt fed, so you may have two to perhaps four equally equipped fire teams, as per the CUTT concept, which you will employ in the assault cycle. Alternatively, if you have a Designated Marksman (DM) team, you may employ them to fill the role of the gun group, utilizing accurate fire in place of the volume generated by the belt fed. It is perhaps a good idea if you can generate four teams in your CUTT, which will allow three equally balanced teams to be employed in the assault cycle, while the fourth specialist DM team is deployed directly by the squad leader to best influence the battle with accurate fire support from a flank. However you need the numbers and more specifically the training to achieve this. It cannot be read off this page and then conducted with any chance of success. We will teach you how to do this on the Combat Team Tactics (CTT) and Combat Patrol (CP) classes, and you will get a chance to put it into action on the Force on Force Team Tactics events. Sweat saves blood, brains save sweat and blood! Great quote….good stuff. I’ve been trying to visualize moving my team around. This really was helpful. Yes, but Combat Patrol would be even more useful.